Epi-Soothe Shampoo is a hypo-allergenic, gentle, soothing shampoo designed to help control and relieve itching in dogs and cats. The active ingredients of Episoothe shampoo are specially incorporated to provide sustained release after the shampoo is rinsed off. 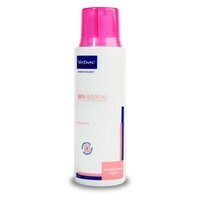 Epi soothe may be used on both non-specific mild itchy skin and focal itchy skin. Neutral pH, pleasantly scented and soap free hypo-allergenic shampoo suitable for cats and dogs. My Miniature Schnauzer suffers from hot spots and these have got worse over the years affecting almost every part of her body. I have tried everything I could think of to help her. Yesterday I bathed her in this shampoo and I cannot believe the difference. I now have a happy, calm and itch free girlie. As an added bonus her hair is soft and shining and it has a great smell! I would definetely recommend this product. We first started using this on our dog in Oct 2011. He suffers from irritated paws in spring from grass pollen and in autumn from fungus spores and can chew them until they are red raw. Since using this shampoo, generally once a month, or more when his paws are sore we have found that it certainly helps. I have used EpiSoothe for years on GSD and NSDTR dogs with skin allergies. Leaves them with soft coat, less dry and itchy skin, smells pleasant, we all like it quite well. I have tried many shampoos on my black lab, most of which bring him out in hives then resulting in itchy flaky skin. With Epi Soothe my dog has a minor itchiness after washing but alot less than with other shampoos.